The WLF was first formed on Twitter around 2010. 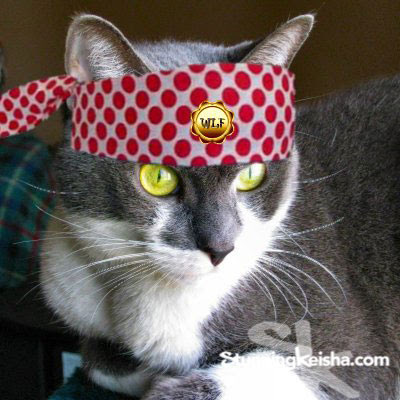 "The Whiskas Liberation Front (WLF), known on Twitter as #wlf, is an international collective of socialist cats and sympathetic members of other species (including the odd human and at least one tortoise)." 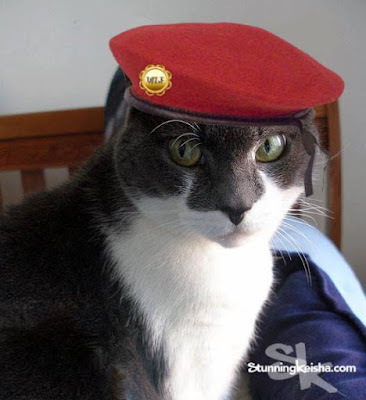 Last week a new #WLF group was formed on Facebook and I was rewarded with an ultra-cool red beret! Our original Mad Hatter is gone—bows head—but life goes on although we still pay homage to her. Years ago, I axed our Mad Hatter aka the lovely Jessie Janey for a Tupac head scarf rather than a beret cos I was ghetto. Yeah, I know he tied his in the front. This looks so much more revolutionary. I'm still ghetto but those berets are so cool. I just had to have one and the new Mad Hatter obliged me. 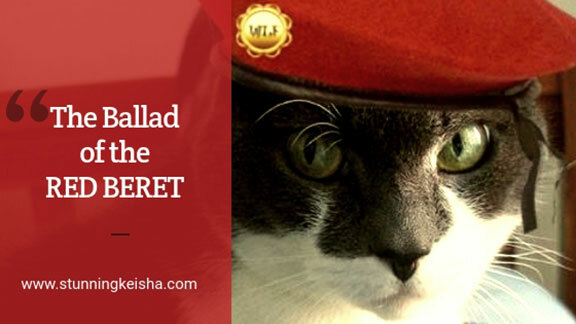 I'm honored to wear this beret and to be a member of the WLF. I was wondering if the #WLF was ever going to migrate to Facebook. You do look smart in your beret. Looking really great there! You should definitely wear it more often! We always thought you looked right fancy in that red beret CK! We love the beret. Red is your color! Looking good CK. Seriously, that beret is the BEES KNEES, CK! I've always loved your look with head scarf. You look super cool. And the beret is also great on you! That red beret is Soooo spiffy. The scarf too. Please can I join? That hat is way super cool! You look good in the beret. It suits you. You wear it well, CK. Great to know the #wLF is on FB and Dash is there with them. I hope to see some of them in Twitter where they started off. You're rocking that beret, CK! You rock both the scarf and the red beret, CK!